There’s Such Thing as “Normal”?! The National Weather Service in Seattle is still holding strong to the WINTER WEATHER ADVISORY they posted for the main Hood Canal area last night, and they say this area may be the last to change to rain. For a more thorough explanation by the NWS, click here. 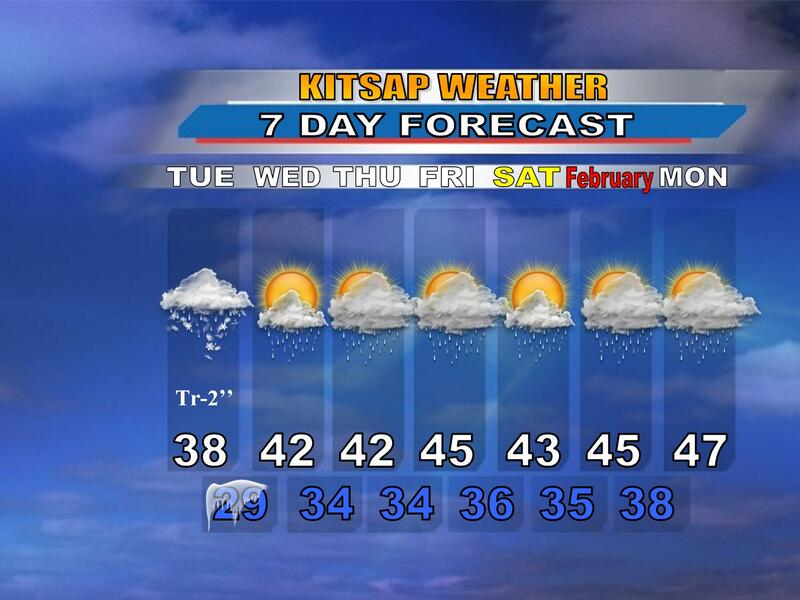 Currently the radar is filled in around Kitsap and most everyone is experiencing an icy snow this morning. This is quite the snowstorm—last year, I went to Wyoming with my family for Spring Break. That was the only time I ever saw winds gust to as high as 50 mph with blowing snow. That kind of weather just doesn’t occur in Western Washington…at least, I didn’t think so until this morning. As I left for school, the winds were blowing (sustained 14 mph, gust to 30) with light, icy snow to add to the mix. It’s certainly an interesting feeling outside…how often does gusty wind and snow occur here?! As for the rest of the forecast, expect continued light snow with gusty winds, accumulating potentially in excess of 2” close to the Hood Canal with accumulations of an inch or more elsewhere in the Kitsap area. At around noon today, expect the snow to taper off and to have mostly cloudy skies with continued cold weather. At this time, there are no school delays/cancellations to talk about mainly because the snow came in so late. But stay tuned as conditions change! Tonight will be calm: increasing clouds, but cold with lows in the upper 20s to lower 30s. The mostly clear skies this evening is the first ingredient we need for snow tomorrow as temperatures will definitely be cold enough. Then, the action starts early tomorrow morning. Here’s another map displaying how much snow is expected around the a rea by 7 AM tomorrow morning. As you can see, the same thinking applies as yesterday: southern and western portions of Kitsap will likely get a good inch or so of snow, granted everything pans out as expected on the models. The northern/eastern Kitsap County areas could very well get squat with this system as the Olympic Snow Shadow will prevent any significant accumulation: maybe a dusting or so, but overall this looks like a “the more south you go, the better chance for snow” situation. By mid morning, a warmer southerly wind kicks up, scouring out the cold air the Hood Canal usually gathers during these cold spells. This means any left over precip will largely be rain, though by the time the switch over occurs, precip will be lacking. Residual showers and even a few sunbreaks are in the forecast for Wednesday with highs in the lower 40s, so still a chilly one out there! The same thinking goes for the remainder of the week: periods of rain with a break in the action Saturday as skies clear before the next round of rain arrives for later in the weekend into the following week with average highs in the mid to upper 40s. P.S. I’ll really try to get a video prepared for tomorrow. The past two weeks have been full of finals and senior projects, so videos have been harder to film lately.